Representation of a fish, the body made of carved Jelutong wood, the fins and tail in sycamore and lime, painted in blues, greens and pinks. Main body made from Jelutong wood, with fins and tail in sycamore and lime. Glued together to leave an internal cavity. After final carving, the body is opened up and the inside finished to leave a consistently thick skin to the fish. Colouring achieved with a silver finish followed by a transparent colouring, then layers of wax to seal and protect. 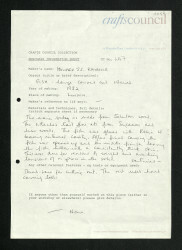 Fish, Howard Raybould, 1982, Crafts Council Collection: W47.